Newberry National Volcanic Monument is located south of Bend, Oregon, within the boundaries of Deschutes National Forest. In a region rich with interesting geology, the landscape found within the Volcanic Monument stands out. Lava flows, cinder cones, a cave, and an obsidian field combine with the typical Northwest lakes, rivers, forests, and mountains to form a unique and amazing landscape of rock and greenery. There are many interesting and scenic sites to visit within Newberry National Volcanic Monument, so plan to spend a day or more if you can. Here are the highlights. Located just off of US Highway 97 at the north end of the monument, the recently-updated Lava Lands Visitor Center offers films and exhibits focusing on the geology of the region. From the visitor center, you can experience the volcanic landscape first hand on two short interpretive hikes. The Trail of the Whispering Pines, a 1/3-mile loop, passes through the forest at the edge of a lava flow. The Trail of Molten Lead takes you right into the lava flow along 3/4-mile of paved trail. A road from the south end of the visitor center parking lot leads to the Benham Falls day use area, where a short trail will take you to the falls. Take a short drive north from the Lava Lands Visitor Center parking lot to explore one of Newberry Volcanic National Monument's highlights, Lava Butte, a nearby cinder cone. 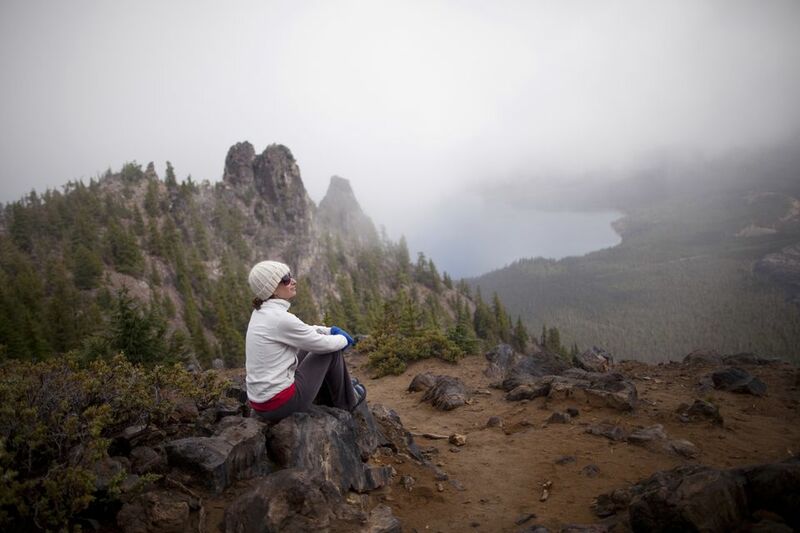 At the top, you'll enjoy incredible 360-degree views that include the lava flows as well as Mount Bachelor and nearby Cascade Mountain peaks. You'll also see several other cinder and pumice cones scattered across the land. ​A short trail circles the crater rim, passing by Lava Butte's working fire lookout tower. For an unusual adventure, you can hike underground through the almost-mile-long Lava River Cave, which was formed from an uncollapsed lava tube. Along the way, you'll pass under Highway 97 and can view intriguing rock formations. Be sure to wear appropriate hiking footwear and warm clothing (the cave temperature stays at 40 F year-round). Lanterns are available to rent at the cave entrance. Black lava rock, gnarly trees, and brilliant green foliage combine to create a totally cool, if somewhat eerie, landscape at the Lava Cast Forest. What is a lava cast forest? A lava cast, or tree mold, is formed when lava flows around a tree trunk and solidifies. The tree burns away. The Lava Cast Forest gets its name because of the abundance of such tree molds that exist in this location. A one-mile interpretive trail winds through the Lava Cast Forest. You'll see tree molds in a variety of situations - horizontal, vertical, and in groups. The Lava Cast Forest is reached via approximately 9 miles of Forest Service road. The route is scenic and in good condition, but you won't be able to travel at highway speeds, so be sure to allot about a half-hour for travel each way off of Highway 97.